Happy 2014 Women’s Fiction Writers! Let’s start the new year in style with a giveaway of TWO copies of Ellen Marie Wiseman’s new novel, WHAT SHE LEFT BEHIND. I don’t normally do traditional book reviews on WFW but I wanted to share my thoughts on this book and its author. I don’t do a lot of giveaways either, but it’s the new year and all, and what better way to usher in the new year than with a new book? WHAT SHE LEFT BEHIND is Ellen Marie Wiseman’s second novel. If I gave out stars I’d give it five. The novel is set in the present and in the past, which I always find fascinating, because the thought of doing that myself makes my head hurt. So this is both contemporary and historical fiction in which the author seamlessly weaves together two plots and a compelling cast of characters amidst a detailed and haunting setting. Starting in 1929 we have Clara Cartwright, an eighteen-year-old from a wealthy family who falls in love with an Italian immigrant. I guess I don’t have to tell you that Clara’s father and mother are having none of that nonsense. They actually send her to a “home for nervous invalids” presumably until she gives in and gives up her boyfriend, or at least that’s what Clara thinks. But no one comes to take Clara home. Instead, after the stock market crash when her father can no longer afford the expensive care (incarceration, really) Clara is sent to a public asylum. And I’m sure I don’t have to tell you those weren’t very nice places in the 1930s. Wiseman’s research on the Willard State Hospital is remarkable. There were times that, in the best way possible, I had to shut one eye while I was reading. (This is like looking in the mirror and closing one eye, it buffers the view.) The hospital, its grounds and inmates patients are incredibly vivid in heartwarming and troubling ways. The best parts about Clara were her awareness and her spirit. She never gave in or gave up even though the world seemed to give up on her. There was a tenacious spirit in Clara that was echoed in the present day chapters of the novel. In the present day we have a teenager named Izzy who’s in a new foster family. Izzy’s mother killed her father ten years before and she hasn’t seen her mother since. When Izzy’s foster parents, museum workers, involve her in a project to help clean out and categorize the belongings from the shuttered Willard State Hospital, Izzy finds Clara’s suitcase. I felt for Izzy immediately—she was an angry kid who didn’t want to be angry anymore. Stepping outside herself and into Clara’s life through letters and belongings eventually leads Izzy to realizations of her own. Izzy is not abandoned in the same way Clara was, but they shared the same yearning to belong to a family, and drive to find peace in their lives and hearts. The two story lines are interconnected in overt and subtle ways throughout the novel. Wiseman writes really beautiful prose—and how I wish there was a more eloquent way to say that, but sometimes simple is best. As I read the book I simply thought, “Wow, this girl can write.” Of course I knew that because her debut novel, THE PLUM TREE, is one I read in one day. 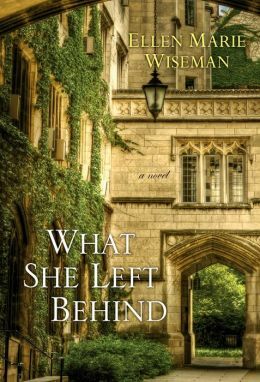 Wiseman’s writing and story-telling is cranked up a notch in WHAT SHE LEFT BEHIND, and that’s saying something. THE PLUM TREE was spectacular historical fiction about WWII Germany. So what makes WHAT SHE LEFT BEHIND women’s fiction? The complex journeys of its main characters, Clara and Izzy. Past or present, in this novel readers see how nurture can both win and lose against nature. Find out more about Ellen on her website by clicking here. And you can buy the book at all the regular buy-the-book places like your local bookstore, Amazon, B&N etc. If you want to see actual photos of Willard State Hospital, and other things that are part of WHAT SHE LEFT BEHIND, go to Ellen’s Pinterest board! You’ll be amazed! Don’t forget to leave a comment to win! That’s great, Regina. Thank you! And yes, Amy is beyond generous when it comes to sharing her excitement for other writers. I appreciate her so much! I hope you enjoy WHAT SHE LEFT BEHIND. Thanks for commenting!! And I admire you, Ellen for taking the time to reply to all of the commenters—-such a simple act that means a lot. I am also sure that your book will also educate many on state hospitals. Congratulations on what is sure to be another great read! Just finished reading “The Plum Tree”” I could not put this book down and felt transported back into time and into the lives of the characters in the book!! I am starting your next book!! Keep writing!! Happy New Year, Amy! Sounds exactly like the type of story I love. Congrats to Ellen Marie! Thank you, Kimberly! I hope you get a chance to read WHAT SHE LEFT BEHIND. Happy New Year! Great job, “I don’t normally review” Amy! I have now entered the abnormal giveaway. Eager to read this one. You make it sound enticing! Thank you for commenting and entering, Kathryn! Good luck and Happy New Year! This book sounds so interesting. I’m looking forward to reading it. Happy New Year, Amy! I adored The Plum Tree and have put Ellen Marie’s new novel at the top of my list. Thanks for putting the spotlight on her! Thanks for the great review, Amy. What She Left Behind sounds brilliant and I can’t wait to read it–whether I win or not! Thanks for commenting, Lori. I hope you enjoy WHAT SHE LEFT BEHIND, whether you win or not! Happy New Year! What an interesting story concept. Very intriguing. I look forward to reading it. Thanks for commenting Kathleen. I’ll cross my fingers for you too. 😀 Happy New Year! I’m 20 pages in and loving it! Sounds like a great book. I loved her first book and if the new one is as good as The Plum Tree, its going to be a great book to read. Happy New Year, Amy. The book sounds wonderful. Thanks, Liz. I appreciate it! Happy New Year! Okay, so I’m DYING to get a copy of this book, and your review just made that stronger. So yay for giveaways, but who are we kidding, if I don’t win this, I’ll still be buying this book sometime in the near future. Thanks for commenting, Tasha. I hope WHAT SHE LEFT BEHIND lives up to Amy’s wonderful review! Happy New Year! I agree that Wiseman’s first novel was thoroughly compelling. This one sounds even better. I’m looking forward to reading it! Thanks for the “review” of this book. It sounds like a great story with which to start the new year. How to get outside own’s life and into the life of another is indeed a worthwhile experience. It sounds like a wonderful book, just like THE PLUM TREE. In a way it reminds me of THE ORPHAN TRAIN with the past and present events (I, too, am impressed at all the great books I’ve read from authors who are able to manage telling a great story that way.) It’s on my list to buy… unless I am lucky enough to win it! Thanks for letting us know of another great book. Thanks for the compliment, Jill. I hope you enjoy WHAT SHE LEFT BEHIND! Happy New Year! How the past informs the present, how we move forward and stay the same is a puzzle that unleashes such interesting tales. WHAT SHE LEFT BEHIND sounds hauntingly compelling. Thanks for sharing, Amy. Thanks for writing, Ellen. Happy New Year! You’re welcome, Jocosa. Thanks for commenting! I hope you get a chance to read WHAT SHE LEFT BEHIND. Happy New Year! I was instantly intrigued by the premise of this story. The past/present and the connection to the state hospital, the old suitcase. All led me to want to know more. I can’t wait to read it. I just completed “The Plum Tree”, so I know Ellen Wiseman is a great author. Maybe I was a day late and a dollar short, but nonetheless 2013 introduced me to Louise Penny and Donna Tartt for some of the best reading of the year. Here is another author, Wiseman, I know nothing about yet a ‘girl who can write!’ That’s what is important to me. As a writer I love the research part, and this interesting review has caught my eye on that level too. A writer who cares enough about her readers to do a good job, the long laborious work, is enough for me to give this book a try. I have a feeling I won’t be disappointed. Thanks so much for commenting, Stepheny. I do hope you’ll give WHAT SHE LEFT BEHIND a try! Happy New Year! Thanks for commenting, Sue. I hope you’ll get a chance to read WHAT SHE LEFT BEHIND. Happy New Year! I have had my eye on this book since I’d seen it on Goodreads and put it in my to-read shelf. I, like you Amy, am always impressed when authors can seamlessly weave two time periods together. Can’t wait to read. Your oveview is an appetite-whetter! Thanks for the opportunity to win. Thanks for commenting, Melissa. I’m so glad WHAT SHE LEFT BEHIND caught your eye! I hope you enjoy it. Happy New Year! As a lover of historical fiction, I’m eager to read a book which weaves the present with the past. I find the concept challenging and admirable. Your posts are inspiring! As I’m writing my first novel, I’m gaining new insight into what makes good writing. “WFW” is a must read for me. Thanks for commenting, Debra. Amy does a great job, that’s for sure. Happy New Year! Happy New Year! The book sounds great, and I can’t wait to read it! Thanks for commenting, Kelly. I hope you get a chance to read WHAT SHE LEFT BEHIND! Happy new Year! I had already chosen this book for my “to read” list–and now your review makes me want to rush out and buy it. I love any of these novels with interwoven plots, especially when there’s a mystery involved. Just the kind of book I like to bring into the tub with my glass of wine at the end of the day! Thanks for the great review, Amy. Thanks for commenting, Holly. I’m so glad WHAT SHE LEFT BEHIND is already on your “to-read” list!! I hope you enjoy it. Happy New Year! Wonderful review! I so want to read this book now after the beautiful and amazing things you had to say about the story and the author. This one is going on my TBR list. Fascinating concepts. My daughter did a film project in college that dealt with the stories behind an abandoned mental hospital near her university. What she learned about treatment should never have happened to anyone. Especially in the U.S. The film FRANCES deals with similar issues. But we had to learn that mental illness deserves compassionate care. I also want to read your first novel about Germany and WWII. Congrats on your success. Thank you so much, Beth! I’ll bet your daughter’s film project was interesting and heart-breaking. I hope you will read and enjoy THE PLUM TREE & WHAT SHE LEFT BEHIND. Happy New Year! Great review.I cant wait to read this one. Please put my name in the hat, Amy. Congratulations, Ellen. Your novel sounds amazing! I’ve been hearing so much wonderful chatter about this book. Would love to read it. I’d love to read this book…sounds like a page turner. Thanks for hosting. Thank you so much, Lorrie! Happy New Year! I am a huge fan of Ellen! She is our book club pick for February! Would love to win a copy. Cannot wait to start reading! What a great review! Can’t wait until my book arrives from Amazon! Loved Ellen’s first book, The Plum Tree! Ellen, I’m also fascinated by the juxtaposition of past and present. I’m looking forward to checking out this book. Thanks for the review, Amy. Sounds great and I love to find new to me authors!! I am really enjoying reading reviews for WHAT SHE LEFT BEHIND, every time I read about Clara I just want to cry–so obviously I need to get a copy of this one! Thanks for the review and a chance to win. I haven’t read any Ellen Marie Wiseman books, but my sister has told me to start. So I’m anxious to read this one. Read your first book, Ellen, and already bought the second, so you can leave my name off the free give-away list. Looking forward to a repeat of the intriguing history and discription you had in your first novel. I loved Ellen’s last book & look forward to reading this new one. I have heard nothing but wonderful things about this book. I would love the opportunity to win a copy! Thank you. This book sounds great and I would very much like to read it. I just finished reading What She Left Behind by Ellen Marie Wiseman. Incredible book! I could not put it down, and my eyes are still a little puffy from crying, but I loved every word! My husband and I adopted our daughter from another country thirty years ago and we have no knowledge of her biological family, so there were so many connections made while reading this beautifully written, memorable book. I will be recommending this to family and friends, along with her first novel which I will read next.